I think it’s fairly easy to go a little coat crazy at this time of year. There are so many amazing high street coats on offer, with a plethora of styles and it’s easy to get lost in choice. Whenever I’m faced with too much choice and temptation I try to bring it back to basics and think about my purchases in terms of longevity. I focus on items that won’t go out of fashion, the classics that will come out year after year. The leather jacket, the classic ‘throw-over-anything’ fur coat, the camel coat, the black or navy peacoat and, absolutely perfect for this time of year, the classic belted trench coat. 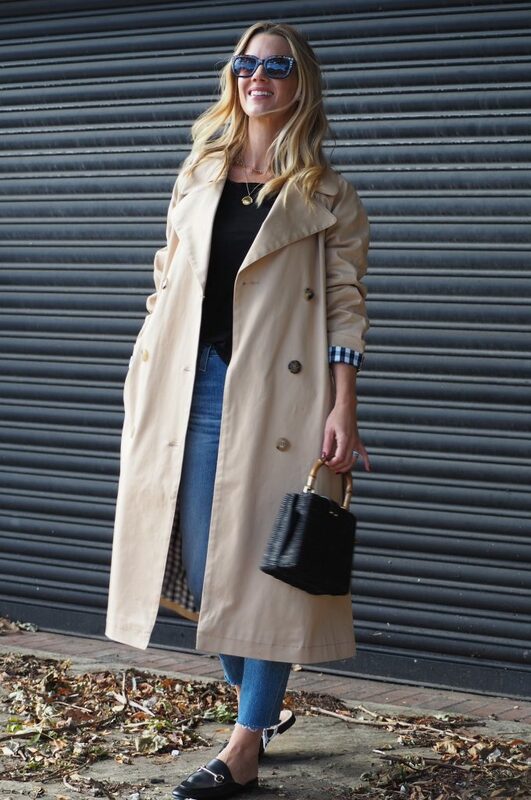 The thing I love the most about a trench coat is the Parisian chic vibe it gives almost any outfit. As shown here, it has the power to elevate even the simplest of outfits. Did you know the trench dates all the way back to 1850?! That timeless tag is definitely justified. I’d also lay money on the fact that both your mum and grandmother had a trench hanging in their wardrobes. I suspect some of you may even be wearing them! 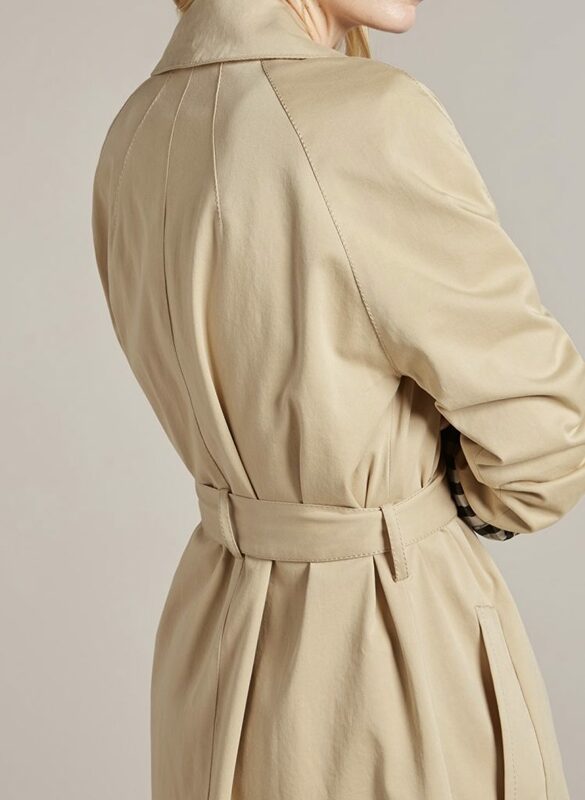 I think one of the reasons that the trench never goes out of style is that is that they’re so wearable and flattering. You can throw a trench over almost any outfit and it works. Minimal effort, maximum style. They are also lightweight, meaning you can wear them over a thick knit without the risk of overheating. I fell in love with this trench from Baujken when I went to the QVC Headquarters to make my selection for my partnership them. The contrast gingham lining really made it stand out and I thought it was such fabulous contemporary twist on the plain classic. It’s 98% cotton, 2% elastane which gives it the perfect weight, a quality that I always look for in a trench. It shouldn’t be too thick and heavy, but you also want it to be weighty enough to keep you warm on those chilly days. The coat is undoubtedly an investment piece with a price tag of £242, but QVC offer the option of two interest free payments of £121 with a 30-day money back guarantee. It’s an oversized, relaxed style and I am wearing a size 8. I would say it was true to size, with room to size down if you are not a fan of the oversized look. A few more features that I love… the drop shoulder allowing room for a chunky knit underneath…the slit at the back…the double breasted design that looks just as good undone as it does buttoned up and belted… the option to turn the cuff to reveal the gingham (or not if you feel gingham interferes with your look) It also has beautiful stitching across the back (see below) The kind of features that you wouldn’t find with a high street version. One of my favourite ways to wear a trench is to balance the masculinity of the trench with a pair of heels, as seen below. They also look great with dresses and skirts. I also love the look of a sharp suit with a trench coat slung over the shoulders. I think a good way to approach investment purchases is to ask yourself a few questions before you buy. Does this piece of clothing fit into my long term vision of my wardrobe? Does it fit my style ? Will I wear it with confidence ?